I'm trying to make a circuit that has a load resistance of 2 Ohms, load current draw of 2A and voltage of 5V. The circuit can only be fed with a 5V@500mAh battery. Please excuse me for any technical errors since I'm new to the field. 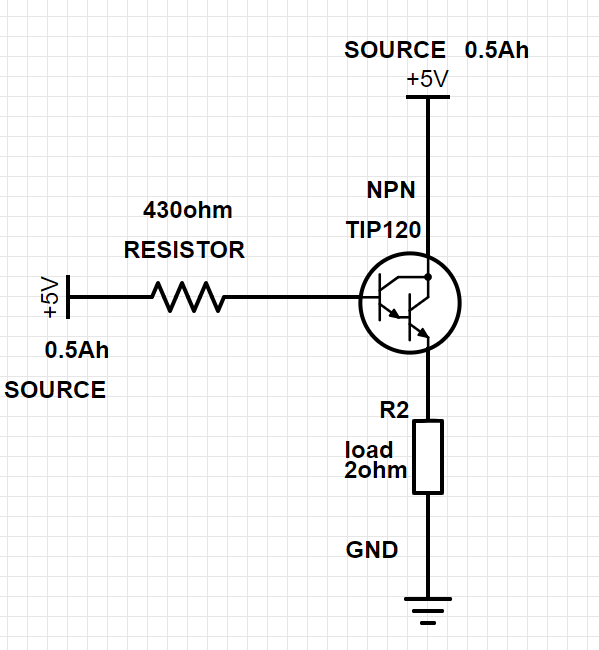 I would love to get some suggestions regarding whether this circuit is correct. I'm trying to make a circuit that has a load resistance of 2 ohms, load current draw of 2 A and voltage of 5V. There is something not quite right with your description. I take it you mean that you have a 5 V supply and that you want to provide a constant 2 A through a 2 Ω load. From Ohm's Law we can calculate the voltage drop across the resistor as \$ V = IR = 2 \times 2 = 4 \ \text V \$. That means that the transistor will need to drop 1 V from the 5 V supply. Now you have a problem. You have selected a Darlington transistor. You will lose 0.7 V across each of its base-emitter junctions so that to get 4 V at the emitter you will need 5.4 V at the base. You will need an even higher voltage at the left end of the 430 Ω resistor. (Please number your components R1, R2, etc. to aid discussion.) In other words, your circuit will not work. Figure 1. (a) NPN version. (b) PNP version. There's more bad news. The TIP120 Darlington transistor will have a voltage drop of 2 V when in saturation (turned fully on). That means that you only have 3 V for your 2 Ω resistor so you will only get 1.5 A through it. If you replace the Darlington with a regular transistor it will drop < 0.5 V in saturation so you will have 4.5 V or so for the load and get 2.25 A through your load. Not the answer you're looking for? Browse other questions tagged transistors current amplifier circuit-design or ask your own question. Datasheet term for transistor power consumption when OFF? If I want to use as little current as possible, then what resistance wire should I use to get the hottest temperature?